Welcome to day 20 of our special National Craft Month celebration. 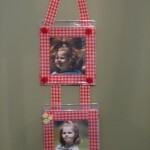 As usual, we’ve got another Project of the Day tutorial and a chance to win another crafty prize! 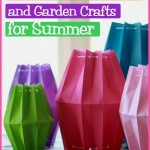 Don’t forget to keep staying tuned in to the blog for more craft tutorials and more chances to win. We’re going to be sharing 11 more projects between now and March 31st, which also means 11 more opportunities for you to enter our craft supply giveaways! Today I’m really excited to share our Project of the Day, which comes from the fine folks at Dimensions Needlecrafts. Spice up your living room by making this adorable needlefelted pillow! If you’ve never tried needlefelting before, you should beware because it’s incredibly addicting. It’s also surprisingly easier than it looks! All you need is some wool roving, a felting needle and you’re ready to create a charming piece of home decor, like this Bluebird Pillow! Wouldn’t this look adorable in your sitting room? Let’s learn how to make it! Cut out a piece of white flat felt approximately 5″ x 8.5″ and a piece of khaki flat felt approximately 8″ x 12″. Attach the white felt to the khaki using grey yarn and the buttonhole stitch. Needlefelt the branch with nutmeg roving across the flat felt pieces. Needlefelt the birds across the branch. Needlefelt the four birds across the branch using the photo as a guide. Add the beaks using the burnt orange yarn. Add the seed beads for the eyes. Sew the French knot border using blue yarn. Attach the completed panel to the pillow cover using brown yarn and buttonhole stitch. And like I mentioned above, don’t forget that we’re giving away a prize every single day of March, right here on the blog for National Craft Month. It’s so easy to enter; just be sure to check back each day for our Project of the Day post like this one to comment to enter! You still have 12 more chances to win and a new special prize each day. Today’s prize is: $50 worth of Dimensions Needlecrafts goodies! 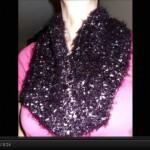 Contest closes March 21, 2012 at 11:59p CST. What was your funniest crafting disaster? I do the typical crafting disasters–sewing the wrong things together, making a card and discovering it is upside down etc. This is still a too fresh to be funny, but I just finished my first fair isle knit project. It looks horrible! There is no consistency in the tension of the stitches. I completed it though and learned a lot in the process. I have so many “small” mistakes over the years, however, I try not to keep those memories, only enough to not do it again!! Just don’t remember one biggie! Made my first newborn baby cap..when the baby arrived larger than average ..over 10 lbs her cap looked a bit small?jewish!It didnt fit!I’m a beginner so I’m learning to adjust patterns some. I hope this win will help me try new ideas! Thanks! Once I made a 30th birthday card for my nephew. I was sitting at my fairly new wood kitchen table while glueing 30 pennies to the card for the finishing touch. I picked up the card to find that my glue had gone right through the card paper and eaten through the finish on my kitchen tabletop. I had 30 penny-size circles all neatly within a 4″x5″ card size square right on my kitchen tabletop! Couldn’t believe I did that!!! I crochet in my sleep and wake up to either a perfect crocheted hat. Most of the time it ends up beig a flat hat or a weird shaped scarf or waking up to a pile of yarn wrapped around my dogs, my husband and myself! My mother is always hard to buy gifts for so I decided to hand paint a complete bisque nativity set. I worked on it for 4-5 months and couldn’t wait for Christmas Eve!!! I knew I finally had the perfect gift for my mom. When she began unwrapping all of my handiwork she oohed and ahhed over one. I was taking the whole moment in until she asked, “Did you forget about Mary and baby Jesus?” I forgot to add them to her gift box. Needless to say, it took away from the moment. Too many crafting disasters to even think about. But at least I have fun. I tried to crochet a sweater for my toddler. One arm was longer and wider than the other arm. I took it apart and made her a hat. LOL! LOL, seems getting things inside-out is a problem for lots of us. I recently finished a purse – a combo of knited and felted pieces – and attatched the cable-knit strap to the body with the cables facing in. my funniest crafting disaster was putting my knitting in a bag and snapping it shut thinking it would be safe from my beagle. I didn’t suspect there would be a thunderstorm while I was out and she would want something that smelled like me. She got the bag open, and had a ‘big time’ as they say here in Texas. I ended up having to cut the yarn to get her free, luckily the needles weren’t chewed — but the nearly finished sweater was just a memory. I really loved that dog, but not that day. I started with disasters pretty young. My funniest one was a Girl Scout project which I sewed to my dress. My family loved that!! I was once working on a hand-quilting project in my lap, and accidentally stitched my quilt to my shirt. I made a stuffed cat out of some recycled material, white polyester…I wanted to hand paint it to look like a tabby. So I carefully applied layers of paint onto the head & body parts only to find out that now the parts are too stiff to sew together…I even tried washing it like 10 times to no avail. Well I still have that beheaded cat around here somewhere! I was spray painting some ceramic flower pots so that I could stencil them later and the nozzle was pointed the wrong way and I spray painted me instead. I now wear that t-shirt for whenever I paint anything. Misspelled a name on a wedding sampler…UGH! I was hurrying fo finish Christmas gifts on Christmas Day, and I was on the last one. I was ironing on applicques on my 5-year-old neice’s sweatshirt. The ones on the front looked perfect. The ones on the back looked perfect, too, until I held the shirt up. The ones on the back were upside down! Since she was small, I told her those sheep had gone up the front, over her shoulders and down her back! It sure wasn’t funny at the time, but I can laugh about it now….I needed one of those signs for my dishwasher that says Dirty & clean on it, so I decided to make one. After I machine embroidered the words on a piece of muslin fabric I then cut the fabric into a circle then sewed a running stitch around it for gathering. Using an old Cd disk I then inserted into my circle of fabric pulling the gathering threads to tighten…perfect so far! I then cut out a circle out of poster board to glue on the back of it…the only glue I could find around the house was super glue, that worked fine until I ended up with it on my fingers & gluing my adorable dishewasher sign to my fingers! Lol! It took some time but I was able to get my fingers pried off of it aventually. My crochet project at the time was a baby afghan using a one-pound skein of yarn. Had an evening’s work into it when I left for work in the morning. Never thought my dog would think that playing with yarn would be fun. Came home to the entire skein having been undone from one end of the house to the other. Took 3 more nights to unknot and reroll the skein into several balls! Made a cotton dress in high school & used the “new” nylon thread. The next morning, I gave it a good press on the cotton setting & went to school. About mid-morning, the dress literally started coming apart at the seams! Oh the lessons we learn! My mishap was a stupid one, on my part! I was sewing this darling sailor boy 16″ stuffed doll, for my nephew’s birth. There was a lot of complicated needlework, but it turned out just beautiflu,I thought! I was so into getting it just perfect, but when I was almost finished, I realized I had sewn the head on backwards! The poor thing went from the “sailor” doll, to the “exorcist” doll. Not the best gift for a newborn! Shade of lilac I could find. As I knitted the body I would take out then begin each row over if there was the slightest hint of a pull or uneven stitch. When I began to knit the arms I thought, I really do not like 3/4 sleeves, I’ll just knit them a little longer. Having no idea what I was doing, I measured, knitted, measured, knitted, measured and knitted some more. When it was done I could not wait to try it on. It was the most beautiful sweater imaginable and I am certain if I were an Ape ALL of the other Apes would have been soooooo jealous! I made wind chimes out of AOL CDs for my boss – sort of a technogeek gift. I used a hot glue gun to attach the CDs. He hung it on his deck. The temperatures climbed up into the 90s, the glue melted, and the CDs dropped to the ground. He got a kick out of how it spooked the cats! I crocheted a hat. I don’t believe anybodys head could possibly be that big! I made a sweater in Homespun knitted from side to side. It looked great but would have gone around twice – it was so stretchy. I created a hat with embroidery for my grandson. It would go over his hand, not his head. I was sewing a lace trim on a Christmas stocking and somehow it ended up on the inside of the top cuff. Time for the seam ripper! hahaha, my daughter’s bedroom. In my last two weeks of pregnancy I decided to turn my daughter’s room into a flower garden and it ended up looking like a nightmare of a flower child from the 70’s on a bad acid trip. I bought $300 of home dec material to make a comforter for our new Cal. king bed. I wanted it big and fluffy so I inserted a sheet of polyester batting. Fringe trim was added around 3 sides and it looked great. One big problem though – it couldn’t be cleaned with the batting inside because the batting needed to be tacked down every 4 inches or it would tear loose and bunch up. I took it all apart, removed the batting, had it dry cleaned, and it will now be a duvet cover. Lesson learned. When I knitted a hat for my son to keep his head warm while he was going thru chemo therapy. I measured his head and it was bigger than the pattern I had so I decided to go up a needle size. the swatch seem right so the next day I started the hat but didn’t realize I picked up the wrong needle which was two sizes larger. When I finished the hat later that day and he tried it on it was so big it slide down the over his eyes. Mmm, gotta say i am not a huge fan of instructions, so pretty much Everytime i try a new craft techique I end up with a mess, but I guess the funniest has to be, the first time I saw pants from a pattern, trying to cut corners I cut only the patterns for one leg and when cut the pieces I FORGOT to reverse them, the thing is I did not noticed, the fabric was almost identical on both sides, but when I put them on surprise! I ended up with a two tone set of pants haha! I misspelled a name on an important cel4ebration cake which I only noticed when the picture of it was posted on Facebook. I knit a sweater for my boyfriend, but it wouldn’t fit over his head! I sewed a dog pillow for my daughter, but I sewed the feet on backwards. She is now in her 20’s and didn’t forget it either. When my mother and I were making candles and the directions called for whipping the wax. We were using the hand mixer and wax was going everywhere. My little brother came into the kitchen to see what was going on and a huge blob of wax landed on top of his head right in the middle. One of my fondest memories of doing crafting with my mom. i had made over 100 Easter crosses and put them on pins to wear. i was taking them to work the next day for the people there. now, i had already been up to about 12am. looking at them as i put them into the carrier. i noticed something.i picked up a few and tested them, not enough glue to hold the pin on to the back of the cross. i sat down and glued them all again. i finally got into bed about 1:30.thank goodness they were a success. I made a GORGEOUS potato chip scarf for the daughter of my good friend. She was on leave from the army with her husband, also a captain in the army. I proudly presented it and it had a tail! A long hangy thing – how embarassing! But they both took it lightly and we all had a good laugh. Whew! Love birds and bluebirds are in the top ten. I crocheted a hat for my daughter and I don’t know what I did wrong but it looks horrible. It looks even worse when you wear it. So if its really cold, raining or snowing, I wear it and cover it with the hood of my jacket. The funny thing is that it’s so warm. My daughter can’t believe that I go out with it on my head, but hey my ears are nice and toasty. Dropping a bottle of glitter on the floor while making Christmas ornaments.